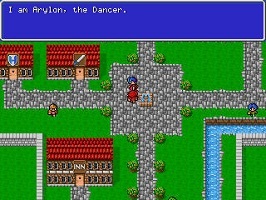 Arylon the Dancer is a minor nonplayable character from the original Final Fantasy which was released in 1987 for the NES and later remade or ported for many other systems. This character got the name only in the American version of the original NES game, in the Japanese version and the remakes, the character is nameless. Arylon can be found in the town of Cornelia and is giving the players party tips which can guide them to the next important event or location if they are lost.She gives 8 different hints during the game. As far as I know there are no official illustrations of Arylon but she was drawn for our Anniversary Art Tribute of the first Final Fantasy in December 2012. There is almost no fan art of this character and I never saw a cosplay of her yet. Back in December 2012 we celebrated the 25th Anniversary of the first Final Fantasy game, Arylon was claimed by OveroneHundred for this project, and the result was the probably most detailed illustration of this character ever.